Here’s another song I learned from Charlie Bridger of Stone-in-Oxney in Kent. According to the Roud Index, it has not often been collected in England (as opposed to North America), but I can’t help feeling that is more a reflection on the prejudices of the early twentieth century collectors than of the song’s popularity. This seems just the sort of melodramatic little number that would have been hugely popular with country singers. We know that the song was in the vast repertoire of Henry Burstow; more recently it has been recorded from Bob Hart and Fred Jordan. Indeed this was possibly the first song Fred Jordan ever sang in public: he sang it, aged six, in a competition held in Ludlow Town Hall, and won a prize of £1 (a considerable sum in the late 1920s). Fred learned the song, like many others in his repertoire, from his mother. You can hear Fred singing the song (as a man, not a six-year old) on the Veteran CD A Shropshire Lad. You’ll find copies of the words on broadsides from the Bodleian’s collection, while you can see an example of the song published as sheet music on the Lester S. Levy Sheet Music Collection site. That example was published in Brooklyn in 1864. However the song must have been published by 1860 at the latest, if we are to believe the 1860 publication date of ‘Do Not Heed Her Warning. Reply to the Gipsies Warning’. I’d like to think that song sank without trace – like most answer songs it’s not a patch on the original (the exception to this rule is of course ‘It wasn’t God who made Honky Tonk angels’). The Gipsy’s Warning – from the Lester S Levy Sheet Music Collection. One of quite a number of songs I’ve learned from Maud Karpeles’ The Crystal Spring: English Folk Songs Collected by Cecil Sharp. Dear old Cecil had the tune and first verse of this song from Michael William Johnson at Ilmington in Warwickshire. Mr Johnson was one of the Ilmington morris dancers; as far as I can see this is the only song that Sharp noted from him. Some versions of this song feature in Christmas folk plays, and are linked to the theme of death and resurrection – see http://mainlynorfolk.info/shirley.collins/songs/pooroldhorse.html for more on this. Sometimes, however, a cigar is just a cigar. And in this case, as far as I’m concerned, the poor old horse is just a poor old horse. Certainly you can read it as a metaphor for the frailties and indignities of human old age, but there’s no resurrection, just an inexorable decline into the grave. Poor Old Horse, collected by Cecil Sharp from Michael Johnson, April 1911. From the Full English archive. Recorded onto a phonograph cylinder by Australian musician, composer and (briefly) folk song collector Percy Grainger in 1908, this fragment of a song has continued to fascinate singers, arrangers and composers alike. 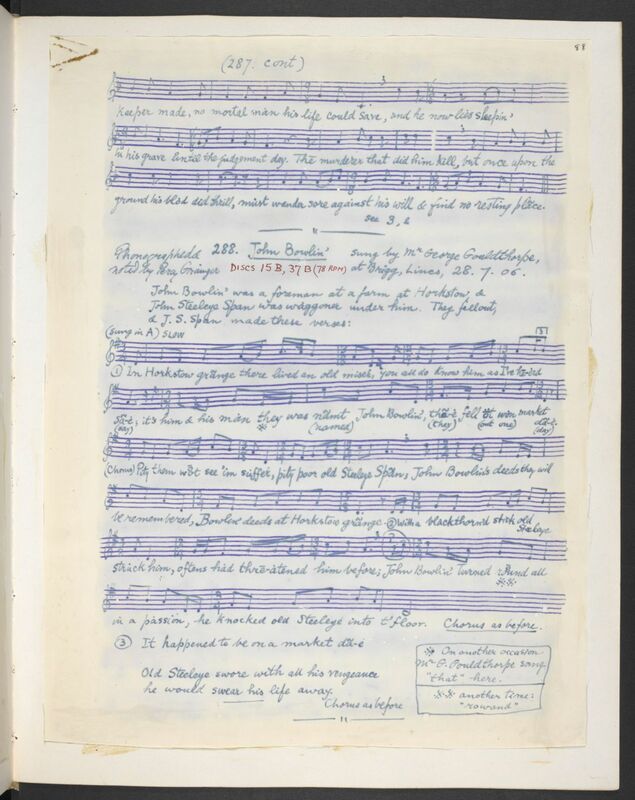 It was first sung to Grainger by George Gouldthorpe at Brigg in July 1906 – see his transcription below from the EFDSS’s magnificent Full English archive. I learned the song from the (also magnificent) Leader LP Unto Brigg Fair: Joseph Taylor and Other Traditional Lincolnshire Singers Recorded in 1908 by Percy Grainger. Mr Gouldthorpe was born around 1840 – he told Grainger he had “a vast of years” – and had lived most of his life in the place of his birth, Barrow-upon-Humber. He had worked as a lime-burner and, by 1908, after a spell in Brigg workhouse, had moved in with his sister at Goxhill. Regarding this move, Mr Gouldthorpe said “I was easier in my mind”. Which, as Bob Thomson comments in his notes to Unto Brigg Fair, “one suspects is a grim understatement of the circumstances”. 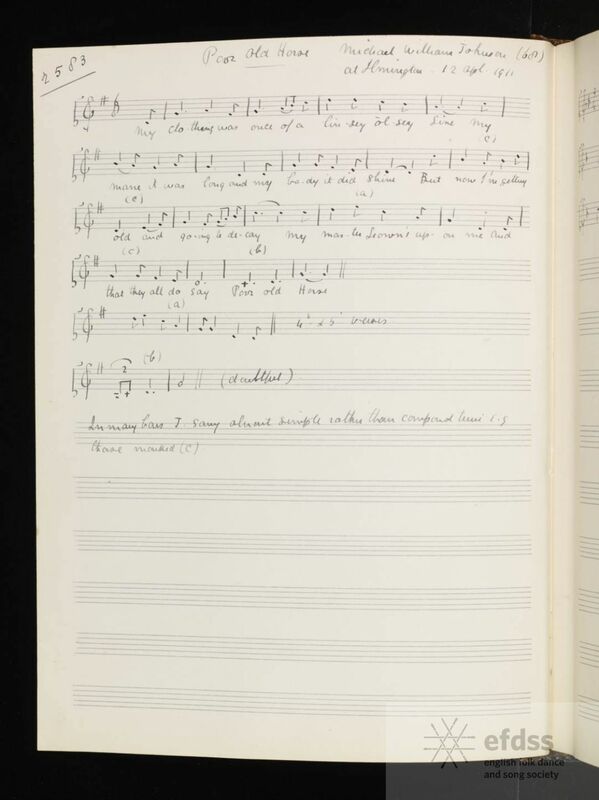 ‘Horkstow Grange’, from Percy Grainger’s MSS, via the EFDSS Full English archive. Both ‘Locks and Bolts’ and ‘William Taylor’ were on the first Martin Carthy album I ever heard, Crown of Horn. But not very long after hearing that record, I got to hear both songs sung by Martin’s source, the wonderful George ‘Pops’ Maynard, via the Topic LP Ye Subjects of England. When I learned the songs, I learned them from Pops, but the way I sang them was very heavily influenced by Martin’s versions. Only one person took me to task over this, and that was the mighty Graham Metcalfe. It must have been 1979 or 1980, at the Gypsy Davy Folk Club, held on a Friday night at the General Elliott in South Hinksey, just inside the Oxford ring road. I had sung ‘The Rambling Irishman’ and ‘Locks and Bolts’. I’d sung the first trying to sound like Cathal McConnell, and the second trying to sound like Martin Carthy – and trying to sound like Carthy at a period when he was, by his own admission, at his most mannered. Graham said something like “You’re a good singer, but you need to sing in your own voice”. Fortunately I had enough nous to recognise that he was right, and started to make a conscious effort to pare away some of the folky mannerisms, and to stop trying to sound like someone else. Others will have to judge if I was successful or not, but I think I can safely say that these days – and in fact for a long time now – I sing pretty well everything in the same voice. A check of the Roud Index shows that this song has been collected just a few times in England, but fairly frequently under various titles in Scotland and, especially, in North America. There’s a good round-up of collected versions, and the song’s history, at www.joe-offer.com/folkinfo/songs/4.html, The links on that page to the Max Hunter Song Collection are broken, but these Arkansas versions are well worth seeking out. The main page for that collection is at http://maxhunter.missouristate.edu/ and you’ll find the various versions of ‘Locks and Bolts’ listed in these search results – give them a listen. The lovers joy and grief, or, A young-mans relation, in a pittiful fashion . Printed between 1674 and 1679 for F. Cole [sic], T. Vere, J. Wright, and J. Clarke [Bodleian 4o Rawl. 566(208)]. The tune indicated, Young Men and Maids, was also known as Locks and Bolts do Hinder and, earlier, as Lulling Beyond Thee; some early forms of John Barleycorn were sung to it. ‘The lovers joy and grief, or, A young-mans relation, in a pittiful fashion’, printed between 1674 and 1679. From the Bodleian collection. Mr Kemp was described by Ford as “an agricultural labourer, aged about 75”. But he may have knocked a decade and a half off the singer’s age: according to Classic English Folk Songs, the only likely candidate to be found in the 1901 census for Elstead is the 86-year old George Kemp. The song is quite rare – the only other known version appears to be one which Ewan MacColl collected from the gipsy singer, Nelson Ridley. If the deserter did come from the West of Kent, that probably means he was deserting from the The Queen’s Own Royal West Kent Regiment; the soldiers who apprehend him, meanwhile, were from the 9th (East Norfolk) Regiment of Foot (later the Norfolk Regiment). You can find a 1990 recording of this song on my album Love, Death and the Cossack.